I have been preparing a research proposal for the Interdisciplinary Ph.D. program at UAF that focuses on "Athabascan Oral Traditions: Deg Hit'an Narratives and Native Ways of Knowing." Much of my current research and language learning centers on kinship and (personal) family histories. Hopefully this research will serve dual purposes in terms of both academic significance and potential value to the Deg Hit'an community. Research by indigenous researchers for the benefit of indigenous communities also dovetails with political/postmodern movements of self-determination, autonomy and cultural regenesis. Maori researcher, Linda Smith (1999) states: "The cultural and linguistic revitalization movements have tapped into a set of cultural resources that have recentred the roles of indigenous women, of Elders, and of groups who had been marginalized through various colonial practices" (p. 111). Although some Deg Hit'an Elders were recorded during the Alaska Native Literature Project and more recently during the development of Deg Xinag Dindlidik: Deg Xinag Literacy Manual there remain several Elders who have not had a chance to record traditional stories and/or lend their perspectives to the history of this area. Deg Hit'an narratives will be valuable as language maintenance efforts proceed and more emphasis is placed on integrating Native knowledge and history into the school curriculum through projects such as the Alaska Rural Systemic Initiative. I grew up in Shageluk, Alaska, an Athabascan village on the Innoko River located in the lower-middle Yukon area. I also spent four years in neighboring Anvik, a village on the Yukon approximately 30 miles from Shageluk. My father is James Dementi of Shageluk, a multilingual speaker of Deg Xinag and Holikachuk Athabascan and English. My mother, Jean Dementi, who died in 1988, was a non-Native woman who came to Alaska from California as an Episcopal nurse-evangelist. In 1976 she became Alaska's first woman ordained to the priesthood in the Episcopal church. Due to a variety of socio-historical influences, most people of my generation did not learn to speak Athabascan. Both the early Episcopal church missionaries and the territorial and Bureau of Indian Affairs schools mandated English and parents had been told not to teach their children the Athabascan language. During the time I lived in Shageluk and Anvik, there were no Athabascan language programs in place in either the school or community. I do, however, remember the first linguists from the Alaska Native Language Center (ANLC) who came to the Shageluk area to work with speakers during the early 1970s. My father and other relatives often worked as consultants in these early language documentation and translation efforts. This contradiction in Native language status, i.e. continuing suppression of local language and culture by churches and schools versus promotion by prestigious outside academic interests, conveyed ambiguous and confusing messages to communities struggling to maintain their local cultures. 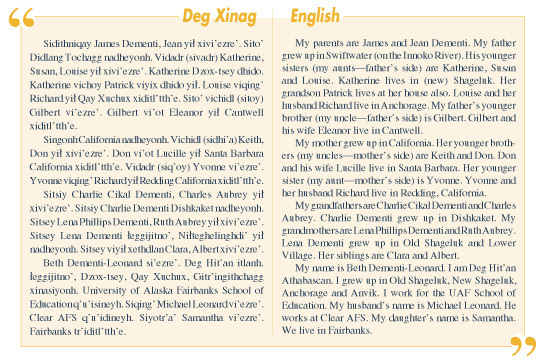 In my current role as language learner-along with other language learners from the Deg Hit'an area-I find myself struggling with the best way to learn the Deg Xinag language and share the knowledge I have documented. Although many of us as language learners work directly with linguists, obvious differences between English and Deg Xinag Athabascan are not articulated and we (the learners) are forced to stumble along as best we can. I believe this is due in part to the lack of knowledge of the deeper Athabascan cultural contexts and constructs and the failure to document language beyond the lexical and grammatical levels. I was an undergraduate linguistics student when I began my study of Deg Xinag. At that time I had no experience in learning a non-European language and was accustomed to being taught conversational language by experienced teachers using immersion methods. I was also used to having an extensive collection of practical dictionaries and grammars at my disposal to assist in the learning process. Although there is not a published grammar for Deg Xinag, there are materials that can be used for language learning. To date, publications include one set of verb lessons, a language curriculum for elementary students, one literacy manual, two books of traditional stories, several short children's stories and a limited collection of supplemental learning materials. The verb lessons explain the linguistic structures at an elementary level for language learners, however, as stated above, significant cultural constructs and concepts are not addressed. Through my academic coursework I would often run across barriers to my own self-confidence in being able to someday speak Deg Xinag fluently. For instance, there is a whole body of research on second language acquisition that says if learning begins after adolescence, the learner cannot expect to become fully fluent in the second language. In a similar vein, linguists often describe Athabascan "as one of the most difficult languages in the world to learn," thereby insinuating that one needs to be of above-average intelligence to indeed even attempt such a process. As a learner and student I have been questioned as to the potential for true authenticity (purity) of Athabascan when learned as a second language and whether or not I think the "back velars"2 will drop out of the language. I began my own language learning by asking for phrases in the languages and listening to taped narratives and literacy exercises. I also would sit down with my father and go through sections of the noun dictionary to find the literal meanings of words. I found that, although writing and studying written language is not considered the best way to learn conversational language, it provided a base for further understanding of the language structure and helped with learning the sound system. I continue my study of conversational language through regular interactions with various members of my immediate and extended family. Sometimes this learning takes place in more formal environments such as the ANL 121/122 audioconferences or Athabaskan Language Development Institute's on-campus classes. On most occasions this learning takes place through informal interaction with speakers through visits or phone conversations. I still use a variety of learning methodologies, including writing the language on a regular basis. One of the more popular ways to teach/learn language involves a method called Total Physical Response (TPR). In English this would require the use of the imperative mode to give a series of commands which require some action on the part of the learner, e.g. come here, open the window, close the door, etc. 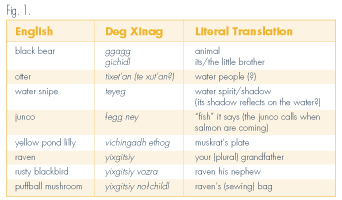 In Deg Xinag, however, many of these do not equate to commands but describe instead what the subject is doing. In the case of "wake up" for instance (when speaking to a child), a more appropriate way to express this in Deg Xinag is "Xe¬edz tr'aningidhit he'?" which translates to "Are you waking up good?" Examples such as these reflect the deeper value system, i.e., a gentle way of relating to children as they awake. I am continually impressed with the Deg Xinag speakers' command of English and Athabascan and their strength and resilience considering the damage that has been done since contact. In the past there was a great deal of travel and intermarriage between the Deg Hit'an and Holikachuk areas, so many speakers have command of at least two Athabascan languages. As multilingual speakers, they are aware of our difficulties in learning these languages and are able to provide the context we often ignore. I have observed that in immersion or partial immersion situations, speakers will adapt their use of language so as to not totally overwhelm, but assist learners through individual levels of learning by varying the complexity of their speech. "Alaska Native worldviews are oriented toward the synthesis of information gathered from interaction with the natural and spiritual worlds so as to accommodate and live in harmony with natural principles and exhibit the values of sharing, cooperation, and respect" (Kawagley, 11). Learners, like myself, who do not have latent knowledge of the language, use a translation approach. Often we inadvertently ask for words or phrases for concepts that do not exist, or concepts that are expressed in very different ways in this cultural context. Learners also tend to provide an incomplete or sometimes total lack of context when requesting words or phrases. As English speakers, we nominalize and decontextualize many concepts, without realizing that Athabascan is a dynamic, verb-based language. One example of differences between Deg Xinag and English categorization reflects the way one would say "Where are you/where is it?" Xidanh is used when referring to people (e.g. Xidanh si'ot?-Where is my wife? ), whereas xiday is used to refer to an animal or object (Xiday sileg?-Where is my dog? or Xiday sigizr?-Where are my mittens?) The same is true for counting people, animals or objects (ni¬tayh/ni¬tay). From what Deg Xinag speakers have said, using these words for "where" and "how many" show respect toward animals who might be offended if the wrong reference is used. This reflects a context of care and respect for animal spirits and other non-human spirits present in the environment, as well as the power of the spoken word. • whether a phenomena is happening now, a little while ago, yesterday, last week, etc. • variations in intensity-a little, very hot/really windy, etc. • Who should have ownership of audio/visual materials? • How will the material be used? • How will the material be cared for? • Where should materials be stored? • Who should have access to the materials? Lately, it seems the endangered languages bandwagon is a popular vehicle for access to "other," providing many opportunities for publication through description and analysis of various Native language revitalization programs. Outside researchers continue to debate the authenticity and effectiveness of projects and programs from non-indigenous perspectives. Language revitalization, instead of being viewed holistically within social and cultural contexts, is often treated as strictly a linguistic venture, i.e. "just speak your language." "Just speaking your language" assumes abilities and resources are available to assist in this process. It involves learning cultural constructs and concepts often hidden in translation along with a myriad of other environmental, ideological and personal factors. Fortunately there are now indigenous educational models providing examples of contextual/situational learning that can be applied at a local grass-roots level. Kawagley, A. O. (1995). A Yupiaq Worldview: A Pathway to Ecology and Spirit. Prospect Heights, Illinois: Waveland Press, Inc. This article is reprinted with permission from the The Alaska Native Knowledge Network's Sharing Our Pathways - A newsletter sponsored by the Alaska Rural Systemic Initiative, the Alaska Federation of Natives, the University of Alaska, the National Science Foundation and Rural School and Community Trust.